a pretty covered market that is the heart and soul of its neighbourhood. a site close to the abbey where the fairs were first held in the twelfth and thirteenth centuries. It was an era marked by civil wars, and the abbots of Saint-Germain-des-Prés saw their finances suffer as a result. In 1482, King Louis XI allowed the monks to organise a fair to support themselves. The duration of these temporary fairs changed several times under the reigns of successive monarchs, before a permanent market was established in the sixteenth century. In 1511 the double-vaulted covered market housed 340 tradesmen’s stalls, but by the seventeenth and eighteenth centuries the fair had become a popular attraction and leisure spot that even featured several small theatres. A ferocious fire destroyed the site in 1762 and it was empty for many years afterwards. As part of the Parisian renovation projects he undertook, Napoleon issued a decree in 1811 ordering the construction of a new market and naming Jean-Baptiste Blondel as the architect. The latter took inspiration from public squares in Italy and designed a set of four galleries surrounding a rectangle measuring 6,900 square metres and framed by 112 stone arches. A fountain and a statue symbolising peace adorned the interior courtyard. In 1860, at the tradesmen’s request Napoleon III had a roof added to the interior courtyard, thereby creating the only covered market on the Left Bank of the Seine river. In 1967 the market was threatened with demolition, along with all of the capital’s other covered markets. In 1980 a decision was made to raze the site, but a vocal local movement, supported by a multitude of charities, writers, historians, artists and politicians saved the day. Several projects blossomed afterwards, aiming to renovate the market and ensuring that it became a focal point for the neighbourhood once again. Finally, in 1992, the Saint-Germain market was brought back to life behind Blondel’s antique arches and twenty resident tradesmen had a chance to make a name for themselves. The boutique was founded by Gilles Sieg’s grandmother, Louise Beaufrère, in 1935. She passed on her love of high-quality fresh flowers and savoir-faire to her daughter, Marcelle Sieg. Marceline’s whole life spoke of her passion for flowers and her customers. She succeeded in making her boutique a joyful and charming place where people enjoyed exchanging ideas and talking. Much more than just a boutique, it was the perfect spot for meetings and chance encounters among the flowers – like a magical garden. Marceline was renowned for being generous, creative and an excellent listener. In 1990, she was awarded the prestigious “médaille de Paris” Award, in recognition of fifty years in business as an artisan florist and as a tribute to the customer service of this exceptional tradeswoman. To this day, Madame Sieg is remembered in especially warm and appreciative terms. 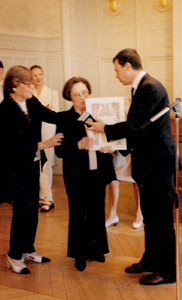 She passed the baton to her son, Gilles Sieg, in 1997. Gilles safeguarded the spirit of Maison Beaufrère as a peerless establishment where flowers always took centre stage. With its high-quality fresh flowers in a range of vivid colours, Maison Beaufrère is known by all as a garden within the city. The family tradition is kept alive with each original bouquet, refined and crafted for you. A florist’s talent is displayed as much by their bouquets as by their choice of flowers. The latter is as personal as it is painstaking. Gilles expects the very best from his suppliers and takes particular care in selecting his flowers and plants. He received this sought-after title in 1985 at the age of 25 and remains the youngest winner to this day. In 1986, he was invited to join the Interflora Floral Art Group, which brings together the most acclaimed florists. The organisation acts both as a vast laboratory where ideas flow freely and also a space for self-expression where florists innovate and share ideas inspired by fashions and trends. The guiding principle is a dynamic exchange of savoir-faire. In 2016, Gilles decided to diversify his floristry business with an e-commerce platform, hoping to share his passion for flowers with an even wider audience. He also established a specialist blog and a presence on social media.